Dyeing Easter eggs is a rite of passage that no child should miss. Tons of store-bought kits are available for this fun Easter project, but there’s no need to make a run to the store. You can dye Easter eggs with items you probably already have at home. There’s no need for a costly Easter egg kit! 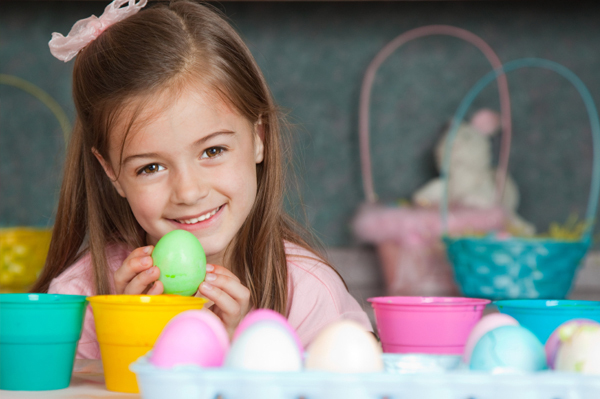 Use items you already have in your kitchen to create an afternoon of Easter fun. That dye is going to look fabulous on those eggs, but not so much on your table or floors. Cover your workspace with plastic trash bags to keep any spills under control. Don’t let your kids wear anything you wouldn’t want ruined — and that goes for you too, as Mom usually catches most of the mess. Fill each cup with 1/2 cup of water and 1 tablespoon of white vinegar. Add 20 drops of food coloring to each cup, more if you want brighter colors. If you’re mixing dyes to make your own colors, make sure each cups gets at least 20 total drops of color. Mix them well. Using your spoon, gently place an egg in each cup, being careful not to break it. Use a different spoon for each cup so you don’t mix the colors. Leave the egg in the water for at least three minutes — more for more vibrant colors — turning it every minute or so. If you’re working with younger kids, using a light touch isn’t easy. Instead of spoons, place each egg inside of a metal whisk. Once the egg is safe and sound inside the whisk, your toddler can mash the egg into the cup all he wants, and it more than likely won’t break. Once your eggs reach the desired colors, set them aside on paper towels or newspaper to dry. If you want to make some fun designs on your eggs, set them up before you place them in the dye. Draw a design on the egg with a white crayon or wrap a rubber band around it before you dip it.